It is the most glorious month since I am re-united with two old friends. 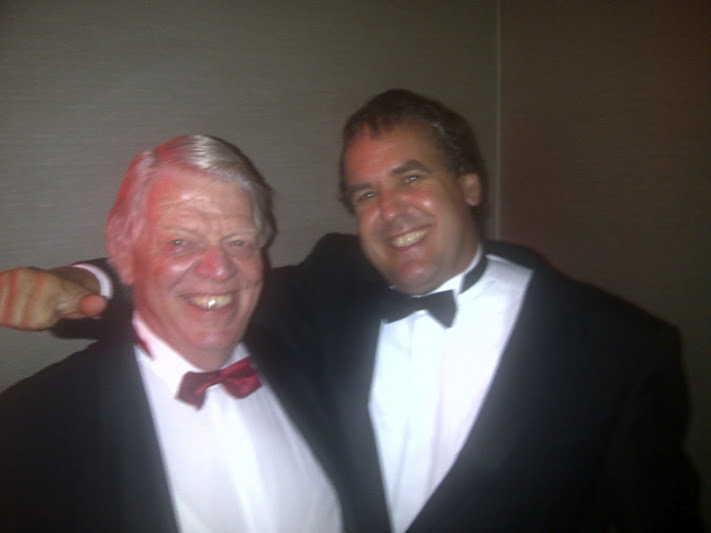 Oscar Klynveld and David Graaff. My only regret is that you are not in Copenhagen with us. 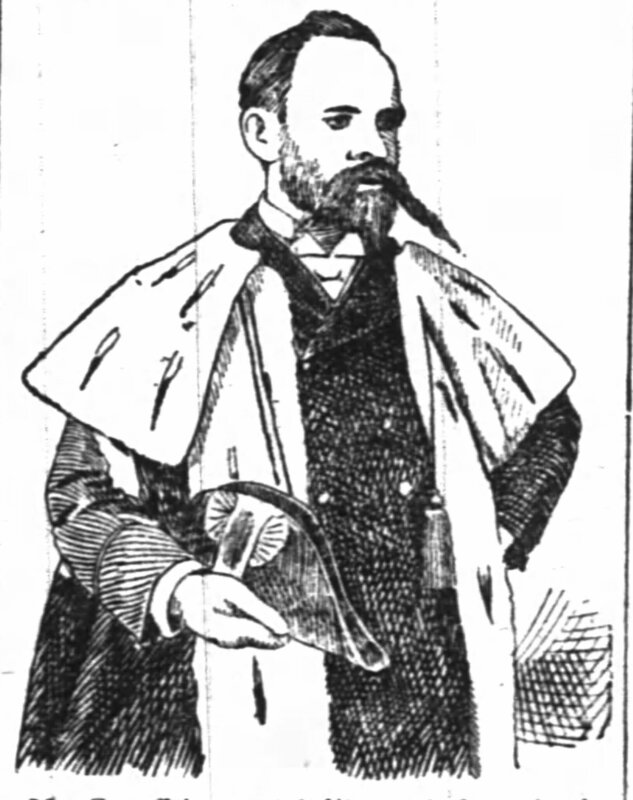 Drawing of David Graaff in his mayoral robes. The drawing appeared in a newspaper in Chicago on 11 April 1892 when he was interviewed at the World Exposition. The most fascinating tale is told by David about how it happened in the mid 1880’s that he visited Chicago for the first time and met Phil (Philip) Armour. This visit had a profound impact on him. In many respects I can see it working out in his ambitions. Drive is something we are born with. David always had drive. Energy. Mentors give direction to our drive. Phil Armour has given David this substance. Ambitions for Combrinck & Co and for the City of Cape Town alike. It occurred to me that this was a special and important development. Phil, like many of the great packers in Cincinnati (Horowitz, R., 2006: 49, 50) was not a butcher but a trader and a businessman. 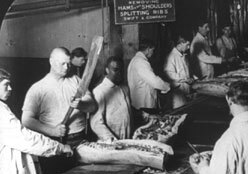 This seemed to have the benefit of viewing the pork trade as anticipating supply and demand, price fluctuations, business structure and processes in contrast with the German Master Butcher who is a tradesmen, narrowly focused on his trade. Oscar has the same ability. He is a business man through and through and listening to David talking about Phil Armour, I realise that it is a huge benefit that Oscar is not a master butcher. The structure of Jeppe’s bacon plant in Denmark is styled after the innovation of Phillip Armour. Apart from consolidating the production line, Phil’s greatest contribution to meat packing and processing is the incorporation of refrigeration into the meat packing plant which allows for curing and packing of meat all year round. I have been writing to the kids three times now about this invention and the implications and the way that it shaped our industry can not be over stated. David was inspired by this and did exactly the same in South Africa when he built his own refrigerated cars. Phil saw what opportunity would follow the discovery of gold and diamonds and true to his nature, he investigated the opportunity. He also knew that as the states in South Africa develop, so would our importance as a grain and maize producer. He had many reasons to be very interested in mid 80’s in developments in the sub-continent. David implemented the concept of own refrigeration cars as soon as he got back to in Cape Town. He had refrigeration chambers erected for Combrinck & Co and soon invested in its own fleet of refrigerated cars for the railways. One day over supper, David listed some of the characteristics of Phil Armour that inspired him. He invest in young people of character and seldom fires them. He regularly re-deploys them in other departments in the business as young people often need some time to find their feet and where their true talents lay. A lesson that inspired David and that I take about Phil is that he believed in obtaining a thorough knowledge of any industry that he gets involved in. This is why I am in Denmark and why I study as much as I can about bacon curing. David then made an interesting observation. After supper when we were having coffee, David started telling about the start of Phil’s illustrious career. Phil was brought up in Stockbridge, Madison county, in the state of New York with six brothers and two sisters. His formal schooling was not the best, but he learned far greater lessons. His mother taught him thrift, energy, economy of time and speech, benevolence of heart and a strong common sense. (The Inter Ocean, 7 January 1901, Page 2). Gold was discovered in California in the spring of 1849. Phil had fallen in love with a girl and became obsessed with the idea of making a fortune on the newly discovered gold fields quickly so that he could return and claim his bride. Having secured the permission of his parents, he joined a small party and set off to the gold fields. None of the party had the means for a sea voyage and they set out on foot. A journey that lasted over six months and took them through rivers and deserts and over mountains with the usual dangers associated with such a long journey. (The Inter Ocean, 7 January 1901, Page 2) An amazing lesson I take personally from this bit of David’s story is that Phil had the respect and relationship with his parents to ask them and secondly, that his parents had the courage to allow him to go! It seems that bold parenting creates bold men! In the gold fields he made enough money to form the basis of his wealth. He moved away at age 24 from California to buy a grocery store and later got involved in a meat packing venture which set him on the course of his life as we know it. David commented that much in the life of Phil Armour resonated with him. He has never really spoken about his time as a boy on the farm in Villiersdorp to me. That night he did. David commented that Jacobus himself started to work in a butchery when he was only a teen to help his mom financially after the death of his father. David knew how to set the stage for a point he was about to make, the trait of a good communicator. He leaned back in his chair while all of us were on the edge of our seats. I have never heard him speak so candidly about his past. I will never forget that night. His point so equivalently made. As I have said, our friend has become a man! When I took Oscar and David on a tour of Jeppes pork slaughtering house and abattoir the next day, David could not stop talking about the impact of Phil Armour and Gustavus Swift on pork slaughtering and how the animal is taken apart for use as primals or sides and the primals turned into bacon. Mr. Armour insisted that every part of the animal be used, contrary to the practice in many parts of the world, including in Cape Town, to dump so called “undesirable parts of the carcass” in bodies of water, or as we do it in Cape Town, leave it on the beach in the hope that the tide will wash it away. 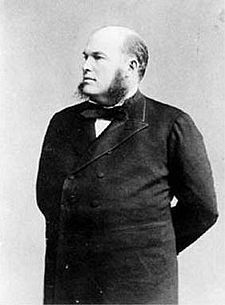 “They devised better methods to cure pork and used lard components to make soap and candles.” (Encyclopedia Chicagohistory) Armour famously said that it is only the squeele of the pig that he does not use. These are concepts that must become part of the life of our proposed Woody’s factory in Cape Town. Each departments tasks must be broken up into its smallest components. It must be logically grouped. Self regulatory systems theory that I have been learning from Andreas dictates that a continually improving, self organising system must contain in its operation feedback loops for the system to respond to as well as “pressure release” or self-regulatory mechanisms. I will have to focus on conditions at home and the Woodys team must create its own production systems and not try and copy what is done in Denmark, England and in Chicago where different scale exist. The approach must be the same, but the application of the principles will differ. Another interesting result of Armours work which inspired David and set a course for his life is how he translated his success into transforming his environment. David would be key in transforming Cape Town just as Phil was in transforming Chicago. The “business practices that Phil pioneered had a direct impact on the skylines, not just in Chicago, but in the USA. Besides the army of workers in the packinghouses, men like Armour needed armies of clerks and managers to run their business. These employees needed office space and many of the Chicago skyscrapers were developed to house these newly created “office workers”. This is a great example of the character and the spirit of Armour and Swift. The exact same direction that was given to the enthusiasm and drive of David Graaff. It will be wrong to credit Phil Armour entirely for David’s drive for urban development and beautifying his city. These are after all global movements. An almost universal drive to beautify the living environments in cities and the realisation of our collective civic responsibilities as fellow citizens on this great earth. (Wikipedia. Built environment. History) What is certain is that David associate himself with people with this spirit and that these concepts were part of the ether that David breathed. He no doubt was inspired by the work of the great industrialists in Chicago. This is clear from the fact that he now returns to Chicago, not as a butcher or a business man, but as the leader of a city with grand plans to dramatically overhaul the face of Cape Town. (The Inter Ocean, Monday, 11 April 1892. Page 9 – 12) I did not question him about this, but this could be the protegee returning to his mentor to show him how he has grown. My dear Ava, please include this letter in the collection of letters that you are saving for the children. David’s visit was concluded by a great banquette in the state hall in Denmark. Christian IX of Denmark was in attendance as were our Danish friends, Jeppe, Andreas and Martin. Oscar and I had a suits made by a tailor in the city which Jeppe manage to arrange for us. The dinner was a grand occasion. I will never forget it! The only part of the afternoon that was lacking was your beauty and presence which I miss every moment! Please send all my love to the kids! I am counting the days to my return. Oscar and myself had much to discuss and made many plans. Much more about this in my next letter! 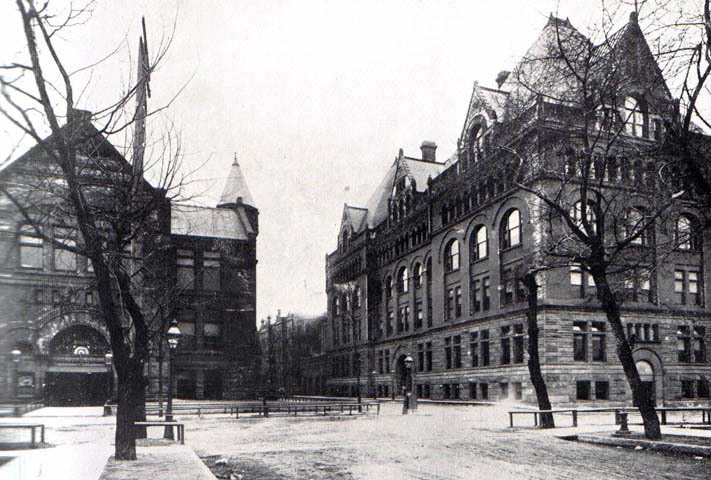 The Manufacturers and Liberal Arts Building seen from the South West. (2) This visit and meeting is purely fictional. There is no records that I am aware of that Sir David Graaff ever visited Denmark. The content of the discourse between Eben, Oscar and David relates to David Graaff’s visit to Phillip D Armour’s company in Chicago. The visit to Armour’s company took place in the mid 1880’s and was one of the first locations visited by David Graaff. This is historical fact. (Dommisse, E, 2011: 32) Everything else is likely, but at best, informed speculation. There is no evidence at my disposal indicating that agents from Philip Armour ever visited Combrinck & Co or invited David to Chicago. It is of course completely possible that a visitor or a business associate told him about Philip Armours packing plant. (5) The discovery of diamonds would have been of great interest to Phillip Armour. Of even greater importance would have been the discovery of gold on the Rand and the subsequent creation of Johannesburg. I have no records of Armour sending agents to Cape Town, but from everything we know about Armour and the fact that David Graaff visited Armour in the mid 80’s to investigate refrigeration and meat processing technology the tantalizing possibility exist that my theory is at least plausible. (7) David Graaff would make his fortune in part on the realization that war with England was imminent and securing supply contracts for the British army during the second Anglo-Boer war. Both Graaff and Armour were optimists, even in the midst of dark days. 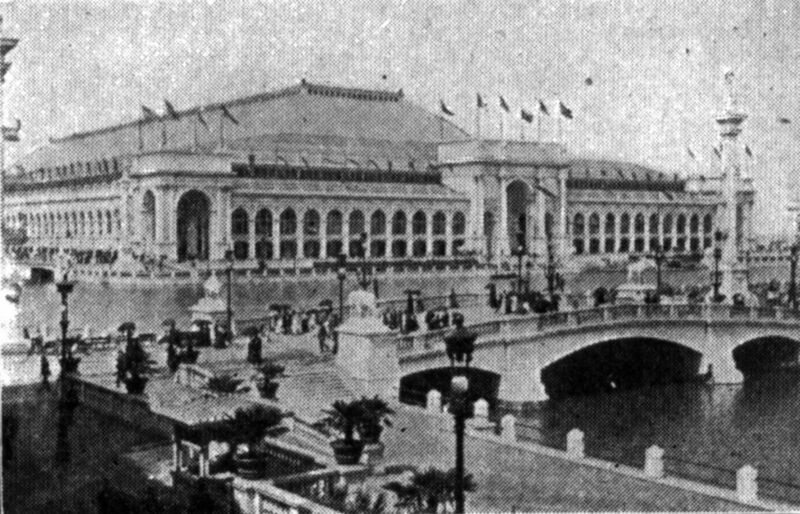 (10) This trip to Chicago actually took place and was widely reported on in newspapers in the USA. The Inter Ocean ran a detailed article on this visit on Monday, 11 April 1892. Page 9 – 12. The Colonies and Indian, 10 October 1891, under the heading “Colonial, Indian and American News Items,” p 11. 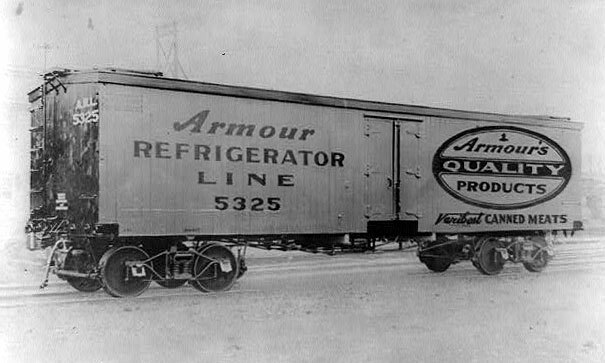 Figure 2: Armour refrigeration car. Wikipedia.